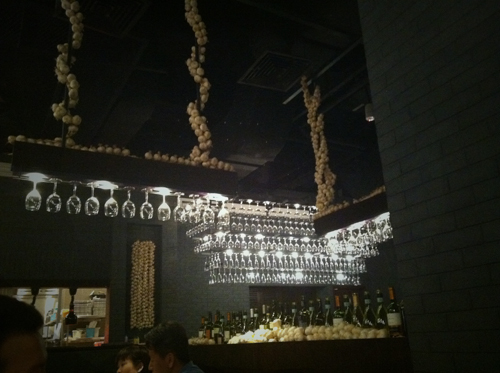 Mad for Garlic is an Italian restaurant from Korea that looks like the set of a horror flick – dim lighting, chandeliers made of wine glass and strings of garlic at every nook and cranny. Known for its menu of garlic infused cuisine, they serve garlic in every possible way. It was a fun place to eat; I imagined that we were on a mission to ward off Dracula with our garlic breathe in my overly imaginative mind. We had two starters. 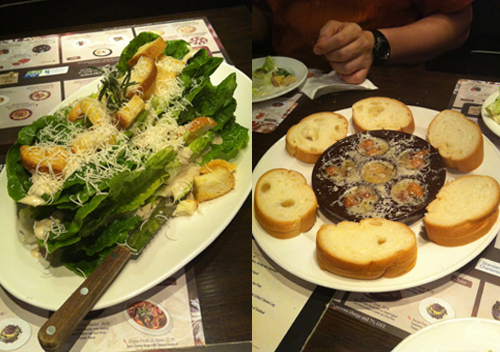 The humongous Caesar Salad ($11.90) was our safe choice while the Dracula Killer ($9.90) was a let’s-try-this-it-looks-interesting dish. Thankfully, the olive oil, melted cheese and fried garlic complemented the bread well in both texture and taste! Suicide Rice was the most spicy fried rice (rated 3 chilli) in the menu. Topped with fried garlic and diced octopus and squid, it is a dish that we, chilli fanatics, got a kick off. The Garlicholic Rice may look similar but it was packed with a different kind of spiciness. It had more capsicum spice that worked well with the shrimp and asparagus. I have to say they were pretty fun to eat because they taste quite different from the typical chinese style fried rice. I didn’t have a bite of my friend’s Red Devil (rated 3 chillis too), but I think he was happy with the generous serving of fresh shrimp, clam and seafood of his spicy pasta. Last but certainly not the least is their famous Garlic Snowing Pizza that we polished off really quickly. The sweet garlic with shrimp and pineapple was excellent though it feels more like a dessert instead of an entrée due to its sweet taste. All in all, we had a fun time at Mad For Garlic. 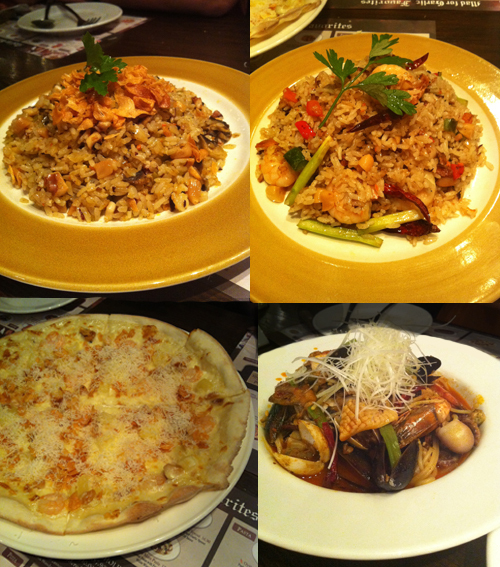 The unique dishes live up to their cute names and we won’t mind going back again. By the way, there’s 1-for-1 entrée if you sign up as a member on their website. This entry was posted in Weekend belly treats and tagged food, happy, pizza, rice, spaghetti, yummy by lifestartsonfriday. Bookmark the permalink. The food looks soooo yummy!! It looked and tasted good! 😀 I thought they were just gimmicky with their names but i was wrong. So many makan places on your blog! *yummy* – I’m so jealous! Hard at work to suss out these places eh? 😀 I like!